Add a refreshing touch to Ramadan bazaars with a zest of lime. 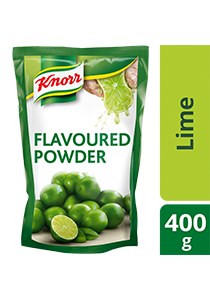 Here are three quick recipes that you can create with Knorr Lime Powder in no time at all. It will shorten your preparation time as there’s no need for squeezing or filtering of the seeds and pulp. Plus, you get a consistent lime taste for every dish. Made for Chefs by Chefs. A versatile seasoning with the refreshing taste of lime, perfect for many food or beverage applications. First, you need to prepare the lime juice concentrate. Mix 300g of filtered water with 100g of Knorr Lime Seasoning Powder in a mixing bowl. Stir well and set aside for inclusion in the following recipes. Transfer blended ingredients into a chilled glass. Fill the glass with cool soda water. Garnish with mint leaf, a lime wedge and a cucumber stick. Boil lemongrass with other ingredients until fragrant. Remove aromatic juice from heat and set aside. Put everything into shaker and shake drink vigorously. Pour drink into a chilled glass. Garnish with lemongrass and a lime wedge.